Risk and Return for Regulated Industries provides a much-needed, comprehensive review of how cost of capital risk arises and can be measured, how the special risks regulated industries face affect fair return, and the challenges that regulated industries are likely to face in the future. 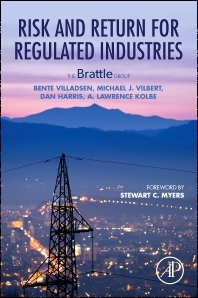 Rather than following the trend of broad industry introductions or textbook style reviews of utility finance, it covers the topics of most interest to regulators, regulated companies, regulatory lawyers, and rate-of-return analysts in all countries. Accordingly, the book also includes case studies about various countries and discussions of the lessons international regulatory procedures can offer. Chapter 1. Motivation: Why a Book Now on the Required Rate of Return? Why Regulate Prices in the First Place? Why is Determining Reasonable Profits Hard? What Should We Expect From Models? Why Does the Tomatoes Theorem Matter? Why Do Different Places Use Different Methodologies? Dr. Villadsen specializes in finance and accounting matters with an emphasis on the energy industry. She is a frequent author and speaker on regulatory return and risk issues and has testified on rate of return and discount rate matters as well as accounting and damages in many jurisdictions including the U.S. Federal Energy Regulatory Commission, state regulatory settings, U.S. and international arbitrations, and the U.S. federal court. Dr. Villadsen holds a Ph.D. from Yale University’s School of Management with a concentration in accounting. She has a joint degree in mathematics and economics (BS and MS) from University of Aarhus in Denmark. Dr. Vilbert specializes in cost of capital, regulatory economics, financial planning, income tax disputes, and valuation. He has advised clients around the country on these matters in various investment and regulatory decisions. Dr. Vilbert received his Ph.D. in Financial Economics from the Wharton School of the University of Pennsylvania, an MBA from the University of Utah, an M.S. from the Fletcher School of Law and Diplomacy, Tufts University, and a B.S. degree from the United States Air Force Academy. He joined The Brattle Group in 1994 after a career as an Air Force officer, where he served as a fighter pilot, intelligence officer, and professor of finance at the Air Force Academy. Mr. Harris is an expert in the economics of gas and electricity markets. He has been involved in client engagements across the full spectrum of the energy industry and his clients include energy regulators, competition authorities, gas and electricity network companies, gas buyers and sellers, and electricity generators. Mr. Harris is a regular speaker at gas and electricity conferences, and lectures at the Florence School of Regulation. Mr. Harris has a MSc. Economics from the London School of Economics and a Master of Engineering from Imperial College London. Dr. Kolbe's work focuses on applied financial economics. His projects address risk, return, and regulatory policy for rate-regulated industries; income tax disputes; natural resource tax and royalty disputes; and firm, security, or project valuation questions in a wide variety of settings. Clients for this work have included federal, state/provincial, and local government agencies; national research institutes; industry organizations; and private firms in various industries. Before co-founding The Brattle Group, where he served as President and then Chairman for a number of years, he was a Director of Putnam, Hayes and Bartlett. Before that, he was a Vice President of Charles River Associates. Earlier, he spent 14 years on active duty in the U.S. Air Force. He holds a Ph.D. in Economics from the Massachusetts Institute of Technology.